One wants only professionals to complete their academic papers. You can check the www.masterpapers.com review to find out about their services, and read the feedbacks to discover the Masterpapers complaints existing. Master paper is an online service where you can order a paper to be completed for you according to the instructions provided. This is a masterpapers.com review. Masterpapers offers a wide range of the papers completed. Masterpapers review and the customers’ feedbacks can show, that the clients risk to not have their paper written accordingly, and the Masterpaper writers do not follow the requirements as stated, so placing urgent orders with this agency may be not the best idea. Still, it is stated, that all the papers are checked for plagiarism, so all the delivered works are 100% original. The deadlines vary from 20 days to 3 hours. The service has a list of about 50 subjects to choose from, that are divided into groups for the customer’s convenience. The services include writing from scratch and editing. It is also possible to order a plain Power Point presentation and add speaker’s notes to it. Editing services include proofreading, editing, paraphrasing, rewriting and formatting and are available for all the academic levels within 7 days to 3 hours deadline. The format of the paper completed is 250 words per page (double space) and 500 words per page (single space) with free title and reference pages, that can be adjusted according to one of the five styles: APA, MLA, Turabian, Chicago and Harvard. 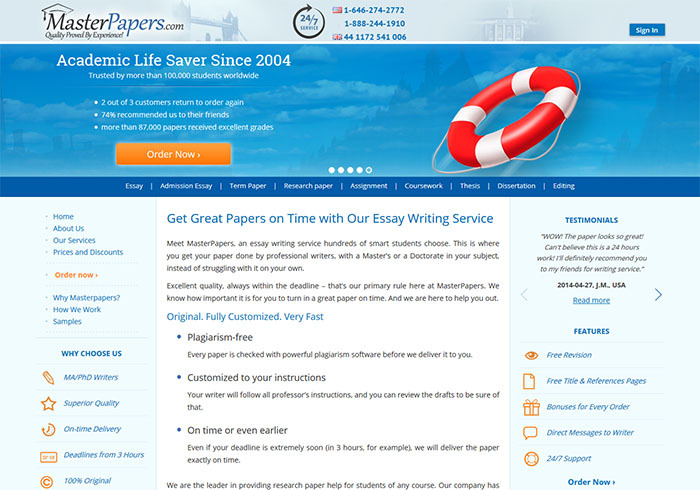 The master papers price quote depends on the deadline, the academic level, the type of service the customer selects and the number of pages. Additional features are also available, and are charged for. The prices for writing from scratch start from $11.30 (High School level, 20 days deadline) and rise to $34.95 for the shortest deadline (High School level, 3 hours deadline). The highest price is set for a PhD level paper within 3 hours – it will cost $44.95 per page without any additional features added. Assign a TOP writer in this subject to do my work. The feature guarantees, that the writer assigned will be a professional in your field, so the paper is definitely completed in a right way according to all the requirements. The price of the feature depends on the academic level. Cost: starting from $10.48. Add Plagiarism Report. The feature will ensure you that your paper is plagiarism-free. Cost: $14.99. Updates via SMS. Will keep you updated regarding your order without a need to check your account. Cost: $3.99. What should be remembered is that these features are not refundable. www.masterpapers.com offers a welcoming 15% off master papers discount code for the first order. You can contact the support team regarding the marterpapers.com discount policy. The major form of discount the customers have is their personal credit balance, and they also will receive notifications about any Masterpapers promo code available at the moment. You can also search for a Masterpapers coupon code available that can help you save up to 30% of your order’s total. The masterpapers.com customer support team is available via phone (there are both US and UK numbers), via e-mail and in chat online, that works 24/7. The support team will respond fast, but they might be not sure how to assist you, as well as the information provided by the supporter might differ from the one stated on the website. All the order details can be clarified with the writer directly, but this takes time, so the clients should be careful with urgent orders. You can also stay updated by following Masterpapers FB page or checking the master papers LinkedIn page.